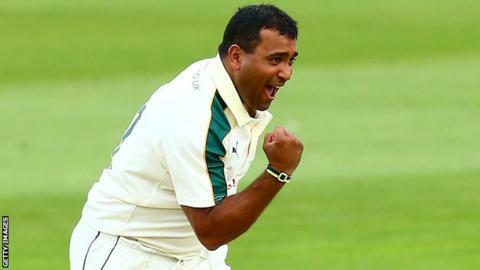 All-rounder Samit Patel has been called up to the England squad for the Test series against Pakistan in the UAE, replacing the injured Zafar Ansari. Twenty-three-year-old Surrey left-arm spinner Ansari, uncapped in Tests, has been ruled out after dislocating a thumb playing against Lancashire. Nottinghamshire's Patel, 30, made the last of his five Test appearances in December 2012 against India. England face Pakistan in the first of three Tests on 13 October in Abu Dhabi. Ansari, who suffered his injury on the same day his inclusion in the England squad was announced, saw a hand specialist and had an MRI scan on Tuesday. His thumb will be reassessed by England and Surrey in about three weeks' time before a decision is made on whether he will join the England Performance Programme and Lions squads for the winter tour schedule. "The timing of this injury was particularly cruel for Zafar and he is naturally extremely disappointed to have to pull out of the tour," said England and Wales Cricket Board national selector James Whitaker. Patel, who also bowls left-arm spin, has a 15.57 batting average in Tests and has taken four wickets at an average of 64.25. He was part of the England squad in 2012 that won a Test series in India for the first time since 1984-85, but has not featured for his country in any format since the Twenty20 series in New Zealand in early 2013. "As a left-arm spinner and a middle-order batsman, Samit is a similar type of player to Zafar and his previous international experience and, in particular, experience of performing for England in sub-continental conditions will be an extremely useful asset to the squad in the UAE," said Whitaker.